Unfortunately, when I tried to thread it up, the final step - where you lower and raise the needle to pull the bobbin thread up through the stitch plate - kept not working. I tried it over and over again, checking each step really carefully, but the top thread got snagged and the bottom thread stayed stubbornly where it was. Every. Single. Time. After many tries, I figured that I really was doing the right thing, following the instructions exactly, and it wasn't me. So I phoned the helpline in the instruction manual and they agreed with me that it sounded like a fault with the machine and I should take it back to the store for an exchange. I quickly phoned the store to check that they had some still in stock and that they would put one by for me, bundled The Children into the car and set off - further justifying the trip by getting some much-needed new school shoes for The Girl and trousers for The Boy while we were out. The new machine works!! *happy dance* I had a happy play with it last night, experimenting with the different stitches on some scrap card, and then today I made a layout. Please be kind, it's my first ever machine-stitched layout! It doesn't like stitching just onto a photo - the back of the photo paper seems to be too glossy to easily feed through. Layered onto something else it sews fine though. It can sew through several layers at a time quite happily, even when one of the layers is chipboard. Having tried different ways of securing the ends of the thread, I prefer the neater ones (backstitching and trimming close, or pulling the top thread through to the back of the page and securing there) to the messy ones (leaving long ends free or catching said long ends into the stitching elsewhere). I actually started off by trying to sew a border directly onto the photo, but as I explained above the machine didn't think much of that idea. To hide the crooked mess I layered a chipboard clothing tag and acetate heart onto that edge. I then added the printed twill, intending it to be angled but somehow managing to get it perfectly straight..... So I added the lace underneath, making sure it was at an angle this time! The letters for the title were die-cut from card that matched the tag (Snickle Script from Sizzix). The background card is Bazzill (I *love* Bazzill!) The close up pics show the colour of it better, the top pic was in shadow so looks darker. yey for you, at last sewing on LOs. fab Valentine's pressie, mel. look forward to seeing lots more stitchery pokery on the blog. I had to groan at the end bit but it still raised a smile to my face. Love the idea of sewing the letters on, and dont worry too much about clogging the needle up with sticky, packs of 5 are fairly cheap (and good to have a spare set around), and easy to swap over. And is the voting bon fide or a stitch-up? It's full of tension, everything that's afoot. But you can certainly buttonhole us for a vote anytime you like. will come undone in future..
You seem to have mastered loads already...very impressed with it going through chipboard!! Love your first sewn layout! And I voted b4 I even got here! Seems like right now you are in a three way tie for 6th place - at least you are making a decent showing! Love the way you created a "shelf" with lace, and I really love how you stitched over the title. Very Clever 'punning'!!! I too am an addict to 'machining' on LO's...try different needles..some are better than others at not leaving too large holes!! I also use my machine to punch designs to then handstitch through. Anyhoo...that LO is fab! This is great Mel, I would love to try stitching on layouts - I have one of the small battery operated sewing machines that is meant for scrapbooking but it doesn't work that well! I think I may have to ask santa for a sweing machine this year! I love your layout! 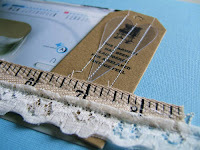 It's very good - excellent for a beginner-stitcher! Was going to offer advice about needles and sticky-stuff-removal, but I see The Creative Beast beat me to it - and her advice was so well put. I'm interested to see just how well a sewing machine copes with stitching paper and card, even thin acetate shapes. I may just have to try it myself! I tried sewing on card and it was quite easy (much easier than I thought...). I got a sewing machine for xmas, maybe we could have a sew-off!? When do the votes close Mel? Sewing is fantastic - very challenged in that department but you have done a wonderful job on your maiden voyage. Great first layout with stitching. I'm very impressed with it. I've been sewing since I was ten; used to be clothes, quilts, all kinds of things. Now it's mending and cards. I've never contemplated sewing through chipboard; bravo for trying. Good to know it works. A great start with your machine. I'm loving getting to grips with mine. Looks wonderful :) I need a sewing machine!